The Exerpeutic LX905 Indoor Training Cycle comes with something extra. A console for tracking performance. And heart pulse sensors for heart monitor. Or if they do, they can cost a lot more. As well as that it has a number of the usual good solid features too. But does that all add up to a bike that you can get a good cycling or spinning workout indoors out of the weather and away from the traffic. In my review look at all this in detail to give you the full picture to see how this matches up to what you want from your spin bike. First up is to see how well it holds steady as you workout. The steel frame and wide stabilizer bars provide a stable platform to prevent the bike from wobbling or shaking at whatever intensity or speed you are working out – in and out of the saddle or as you move in between. There is no annoying creaks or squeaks. You can just focus on your workout without any distractions. If your floor is a little uneven there are 4 levelers at the ends of the stabilizer bars that you turn to balance it up to stop it rocking from side to side just as you would a washing machine. The standard warranty for the bike (from the manual) is 2 years on the frame, and 90 days on other components. It’s not the best warranty but is about average. As the bike isn’t that old in terms of availability there really isn’t customer experience on as to its durability but it seems from reports that it is well constructed and should stand up well to the use and abuse of workouts in the home. By adjusting the position of the seat and handlebars you can set the bike to fit people between the heights of 5ft 2 ins and 6 ft 3 ins. It’s pretty quick to do so this means it can be easily used by multiple users to get their carido workouts. The handlebars can be moved up and down 13 inches which allows you to get the ride you want and to find a good comfortable riding position. It can help take some strain off the back if you’ve lower back problems but isn’t going to be as easy on your back as a recumbent exercise bike. The seat can be moved vertically and horizontally and the handlebars can be just moved vertically. The adjustment method is standard for these bikes using adjustment knobs with pull-pins and pre-set holes in the adjustment poles and slider. Making the adjustments is quick to do to fit the bike to each user size before they start their workout. It does have to be done off the bike. It won’t get in the way of using the bike if it needs to be adjusted because the seat and/or handlebars have been moved since your last workout – it takes less than a minute. You can get a fairly good fit for your size. You might find it slightly out due to limitations of pre-set holes meaning you can only adjust the handlebars and seat to where the holes allow. Also you may find if your torso is longer or shorter than normal that the lack of horizontal adjustment for handlebars results in feeling a little cramped or stretched. The bike has a friction resistance pad that sits on top of the flywheel and the amount of resistance is controlled by turning the tension knob on the frame above it. You turn it to the right to increase and left to decrease it. It moves up in increments from very easy to very hard. It goes up gradually so you don’t end up with easy to impossible in a very small turn. It is consistent resistance on the flywheel as it gets a good grip to prevent any slipping or unevenness in pedal motion. There isn’t any resistance levels marked, which is normal for spin bikes – you’re expected to do this by feel or estimate which is what experienced spinners do. It can make it a little harder to set it at a level you want or return to one objectively. You only get this normally with bike that have magnetic resistance but they do cost a lot more. The resistance pad will wear down over time with use. This is to be expected. Depending on use you may need to replace yearly. You can contact the supplier directly for replacements. The bike has a chain drive like you get on a road bike and this drives the 40 lbs flywheel. The drive is enclosed in a guard to protect it from damage and away from your ankles and clothes as well as pets and children. You may need to tighten and lubricate the chain in the same way you do an outdoor bike (it is done in the same way). Although it won’t be as often as it is inside and it doesn’t move with gear changes. The chain and flywheel helps to give the pedaling a more realistic and natural feel to your ride by pulling the pedals around the stroke. The bike has a fixed gear which means when the flywheel is moving so are the pedals. You can’t coast and need to gently slow down or use the brake on the tension knob to stop the pedals moving. It does help to provide a better riding feel and means you can’t take it too easy when your workout! The flywheel is made from chrome and cast iron helps to prevent it from being corroded by sweat but you do need to wipe off sweat as it will over time start to corrode it. There isn’t a guard over it or the resistance pad so sweat is likely to drop on it. Also it is important to keep it away from children and pets especially when in use as it moves fast and could injure them.. The aluminum alloy pedals are screwed into a 3 piece crank that provide a good solid platform so there’s no moving about while you are standing pushing hard against the resistance. The aluminum alloy will also help protect the pedals from the corrosive effects of sweat. The pedals have a toe cages and strap for helping to keep your feet in the correct position on the pedal and stop them from slipping so you can push and pull without any worries. The strap allows you to fit the cages to your foot size. If you want you can replace the pedals with your own specialist pedals as the cranks take a standard bike thread. Seat. The seat is cushioned and shaped to help in giving comfort while in the saddle. How hard it is on your sit bones may depend on how often you are out of the seat on your hill climbs. However, as with any type of bike seat not everyone is going to find it to their liking. It can take some time to break in any seat or to get used to it, but not everyone is going to have this happen. It’s going to continue to hurt. If you are one of those who can’t get used to it, then there are a few things you can try. A gel seat cover or padded bike shorts can often be enough to add the comfort needed. If not, you can look at replacing the seat. The seat has a standard bike fitting so can be swapped for a more comfortable seat if you prefer. Handlebars. The handlebars are shaped to give you plenty of hand grip positions it has a large loop in the middle and long bullhorns. The handlebars are covered with a soft foam coating to provide a more comfortable and secure grip when hands get wet. It also helps to prevent the formation of blisters. You may find when leaning on them with your forearms for an aero position that you arms get sore so you may want to buy elbow pads separately if this is something you expect to do for extended periods of time. Noise. The bike does make a little noise. There is going to be soft clinking from the chain and shushing noise from the resistance pad. It’s not silent but you can hear the TV with just a small adjustment to the volume. People in the next room sleeping shouldn’t be woken by your workout. If you want a quieter workout you could try a belt-drive bike – it will have less of bike feel as you pedal – it is possible to get a bike with a 40 lbs flywheel without a heart rate sensors and not as good a console but is a cheaper option and rated well by customers – the Sunny Health & Fitness SF-B1423. If you live in upper floor apartment you may want to put the bike on a rubber exercise mat to remove any possibility of noise or vibration being experienced in the apartment below. Dirt and Dust You will probably notice a little dust from the resistance pad and possibly a little lubricant from the chain. But probably the biggest cleaning issue is going to be caused by sweat. This is very corrosive so it is best for it to be cleaned up after each ride for best results with a soft damp cloth – it only takes a few moments – it will help to stop the bike corroding and parts gumming up. You might want to put the bike on a rubber exercise mat to prevent sweat and lubricant dropping on it.. The bike requires an area of 22 by 57 ins when not in use. So, it is probably too large for most closets. It’s a reasonable looking bike so won’t look too bad against a wall or under the stairs if you can’t leave it out or in a separate area when not in use. There are 2 small transport wheels at the front of the bike to help in moving the bike around. It’s easy to tip the bike on the wheels (most of the weight is at the front of the bike) and move by one person. The wide space between the wheels helps to stop the bike tipping. The wheels are exposed so work well on most surfaces including carpet except the softest and those with a very deep pile. On wood floors it is a good idea check if the wheels dent or scratch it before you move it all the way across it. The bike is delivered part assembled with a shipping weight of 122 lbs. Everything you need to finish the job comes with the bike including tools. The tools are fine but you may want to use your own (adjustable wrench and Phillips screwdriver) to get it done quicker. It is an easy job to put it together with it being able to be done in an hour or so. The most difficult part has been done for you. You are required to put on the pedals, stabilizer bars, seat, adjustment posts, water bottle holder and console to the frame and drive. Although it can be done by one person you may want two people to help with the box and holding the bike steady while the stabilizer bars are attached. They can also help with holding the other pieces steady while you bolt them on. Not only is it unusual for spin bikes and indoor cycles to have a console this one comes with more features too (targets and a recovery test). It measures time, distance, speed, calories, RPM and pulse. You can set targets and take a recovery test too. It has a split display where at the top you can set to display one of the measures (except speed and RPM where it rotates between them) or you can set it to scan through the measures every 6 seconds. At the lower part of the screen in smaller size it displays these numbers in 5 sections. I always like this – it seems to help to keep me motivated seeing the numbers go down rather than up. You can also set a target heart rate where the console will beep in alarm when target rate is reached. The RPM measure can help you stay on track with many of the workout programs. I like this as I’m not one of those who can get this just using the music or relying on experience. The numbers are clear and easy to read except when in a poor light conditions as it isn’t backlit. There are 4 buttons under the screen are set, reset, mode and recovery. The first 3 are for setting up the display for a workout. The 4th button recovery you can press at the end of a workout to take the recovery test. You use the hand pulse sensors and the console counts down to zero and give you a score from F1 to F6 with F6 being poor and F1 being outstanding. It is something you can use to see your progress over time. The hand pulse sensors are in the end of the handlebars. To monitor your heart rate you have to both tightly. It does restrict your grip if you want to monitor your heart rate. Even if you take one hand you’ll lose the reading. Also these sensors can be very temperamental and you may find you can’t get a reading anyway. If this is something you want to monitor for training or health reasons you will get a better result with a heart rate strap and monitor it separately. The console is powered by 2 AAA batteries that are easy to replace in the back of console as needed. It turns on automatically when you press a button and turns off after 4 minutes. Your previous workout is retained unless you clear it using the rest button or remove the batteries. The console doesn’t have any pre-set programs or give you the ability to upload your results to a fitness App or account to be able to track progress. You have to do this manually. The bike has a water bottle holder at the side of the front support near the flywheel. It’s in easy reach and will fit a good size bottle – it’s not as good a position as on the handlebars but you won’t have to stop pedaling to get it or put it back although you may need to slow down. For beginners the manual doesn’t provide much in the way of guidance. It does have suggestions on warming up. But there is nothing on actual workouts or how to get the best position for the seat and handlebars. I’d have expected to see something on this for a bike that is a good choice for beginners. Fortunately this information available widely on the internet and there are videos and DVDs you can follow along to for workouts. There is only a small number of reviews for this bike. To date 85% rate the bike a 4 or 5. There are 3 customers who have reported a bad experience. At least some of this was due to problems with shipping damaging the bike due probably to the weight. There doesn’t seem to be an issue with this since January 2016 (it is a relatively new bike). Aside from those very few instances other customers say in their reviews that they get as good a workout as they can get at the gym, it’s easy to assemble, it’s solid and reasonably quiet. This is a reasonably priced bike, you are getting a reasonable console and 40 lbs flywheel included. It’s not the cheapest but it seems well constructed and some bikes that are more expensive do not offer the same features. Customers seem to feel that they get good value. 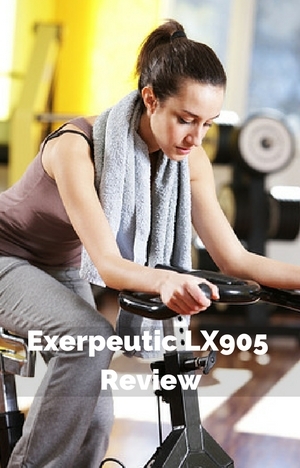 The Exerpeutic LX905 Training Cycle is a good bike for beginners and more advanced exercisers too. The resistance can go from easy to hard catering for people’s different levels of fitness and goals. There are no pre-set programs or help for beginners, you need to come up with own and search online for help. The console is a basic but does measure RPM which helps in keeping up with workout programs. You can also set targets which again is more than you see on many consoles (if they have them) on spin bikes and indoor cycles. So, to summarize the review – it is a good spin bike or indoor cycle to be able to do you cardio workouts in your home whatever your level of fitness and goals are. I wish I could be accountable to a home exercise program, this bike seems like it would fit the bill and would fit nicely in my basement family room. This is a good bike to get started on and you can use it while you watch TV etc to help take your mind off the exercise if that’s an issue. Or do you prefer the gym or outside? Do you have to unbolt and bolt the handlebars to do this?